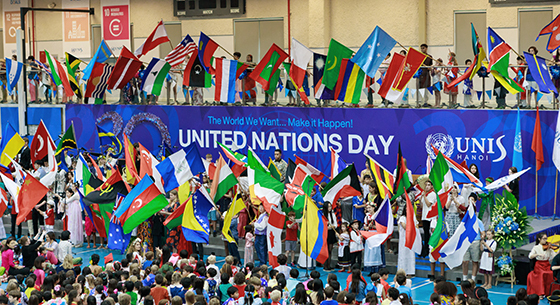 In the year that the UN Celebrated its 70th anniversary and launched its Sustainable Development goals to end poverty, fight inequality and injustice, and tackle climate change by 2030, the Board of Directors at UNIS Hanoi also looked to the future, to clearly articulate what it means to be the United Nations International School of Hanoi. As one of only two UN International Schools in the world, our relationship with the United Nations in Viet Nam is at the core of our School identity. For nearly three decades UNIS Hanoi has committed to educate learners to help change the world, guided by UN Principles, and in service to the development of Viet Nam. Viet Nam has transformed from one of the poorest countries in the world into a lower middle-income country, and is now considered to be one of the most dynamic emerging countries in the East Asia region. The work of the United Nations in Viet Nam has been at the forefront of UN reform. It was one of the first pioneering countries in the world to start to “Deliver as One”, with all agencies working together, making the UN in Viet Nam more responsive and effective to the country’s rapidly evolving needs. And UNIS Hanoi has grown from 11 students in the borrowed classroom of a local high school with a teacher on secondment from UNIS New York, to today’s purpose built campus welcoming daily more than 1100 students and representing more than 60 nationalities and 40 mother tongue groups. So as the School prepares to celebrate 30 years of Learning to Inspire in 2018, what does it mean for the future, for our learning community and for Vietnam to be the United Nations International School of Hanoi?